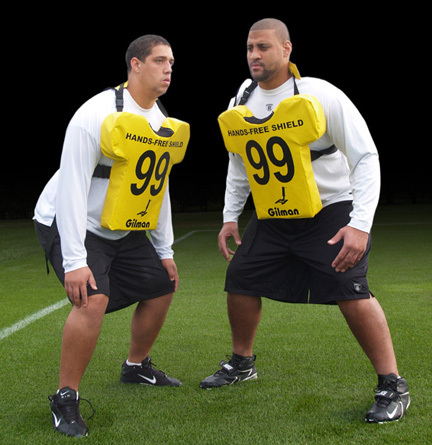 The FIT SHIELD® is a double decker shield. The bottom pad is firm and supports a softer top pad that is easy to grip. The top pad is mesh covered to give it the look and feel of a jersey. Perfect to grip and squeeze with your hands. There is a crease between the pads to allow a full hand grip anywhere along the side. The top pad simulates the shoulder pads with armpit and breast plate targets. Jersey numbers offer a visual for eye focus. 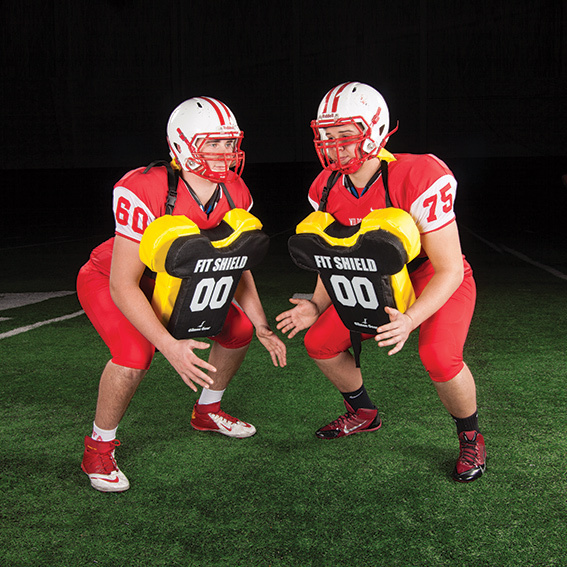 The narrow width of the top pad encourages a blocker to bring the hands in tight to strike. It's a natural for shooting the hands and gripping with the thumbs up! The pad has a shoulder and back strap and is designed to be worn. Allows the holder of the pad to move and take on blocks with his hands. The shoulder and back straps have a quick release buckle for easy on and off. Supplemental handles are stitched on each side to allow a player to pull the shield tight to the body. Also gives the player an alternative to buckling the straps when time is of the essence. According to many state football associations, the wearing of a protective pad doesn't count against the time limits for "live" contact. The safety and realism of this pad makes it a viable substitute for "live" contact drills. Wear it during non-padded or padded practices. This pad is highly functional. It allows coaches to teach the game the way it is played today. Two handles. "The coaching point is to shoot the hands and grip!"